Spent a "spur-of-the-moment" Sunday evening at a lovely B&B (Point of View in downtown Seward) with my friend, Jaci. We enjoyed a relaxing evening before an appointment I had earlier today and the return drive home. 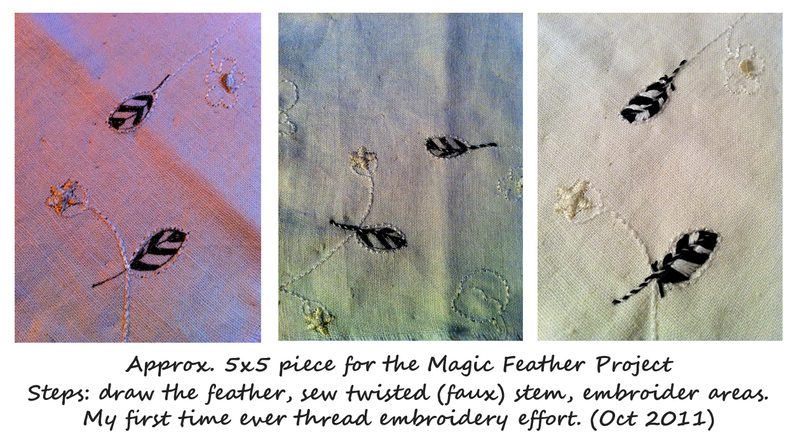 Main Objective: to complete my Magic Feather Project at the SPIRIT CLOTH BLOG... you can check out the stats by clicking on the link in my sidebar. The gist: 1000 approximate 5x5 fabric pieces with hand embroideried feathers are sent to Jude Hill who is assembling or donating them to a children's charitable cause. What a generous undertaking. The idea has been traversing the internet for a few months and I saw it on Michele Unger's blog (Bell Street Journal, Sept 5 Posting). 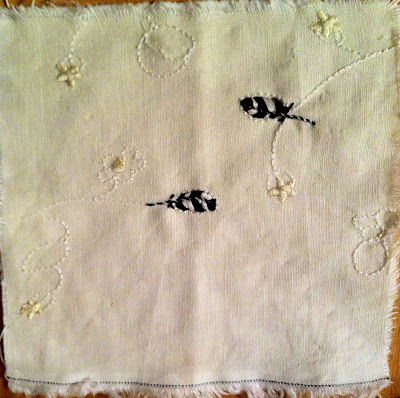 This is my first attempt at thread embroidery -- I intend to make one for a "remembrance book" using flannel cloth from an old wearable (LOL, couldn't give it up).